This is a comparative overview of the most important computer-assisted qualitative data analyses software (CAQDAS, Fielding & Lee 1995) packages. Unlike most other reviews, it is not ordered by software products, but by product functions. As software capabilities are in a constant flux, we will aim to keep these pages up to date to reflect the latest versions of the reviewed programs. Although it is true that all CAQDAS programs fulfill similar tasks (Lewins & Silver 2004: 3ff; Weitzman and Miles 1995), at the same time there are some substantial differences between the different packages (Heimgartner 2005; Lewins & Silver 2004; Lewis 2004). These are not simple differences of taste. As I have demonstrated elsewhere (Koenig 2004), specific methodologies might require a specific CAQDAS, which may not always be the program most widely available. Even if the CAQDAS available to you might support your chosen methodology, classical path dependence theory (David 1985) cautions us against choosing a program solely on the basis that it is available at one's institution. Since the learning curve for almost all CAQDAS is steep, even peer group support might not outweigh the advantages a better fit for your methodology might have. Elsewhere I have followed others (e.g. ; Lewins & Silver 2004: 3), who argue that CAQDAS cannot decide about a methodological approach. I would even go further and suggest that CAQDAS affinities with certain methodologies may steer the analyst subconsciously towards these methodologies. It is therefore essential to decide upon one's methodology, before a decision on a specific software can be made. Once the methodology is chosen, you can identify the tasks a software should ideally perform to support this methodology. The following pages might assist you in this decisions, as will other software reviews and the developers' pages, which can be found here. Also, keep in mind that some qualitative approaches might be served better by software not specifically developed as all-purpose CAQDAS. If you require only some CAQDAS functions, you might be better off with general purpose software or more specialized programs, such as Transana. To facilitate this decision, some of these programs have been included in the comparison. After reviewing technical and ergonomic features of the softwares, their suitability for different forms of textual and multimedia data, this comparison follows the conceptualization of the main CAQDAS functions, as they have been identified by Weitzman and Miles (1995): Searches, coding strategies, and theory visualization networks. It is finishes with an assessment of their stability and speed, statistical functions, and a review of their idiosyncrasies and some methodological affinities. This review explictly aims to include also software, which is not usually considered QDA software, as many of these progrmas fulfil some (but never all) of the functions that CAQDAS perform equally well or better. In many cases, more specialized programs, such as fs/QCA for ("Fuzzy Set") Comparative Analysis, or more general programs such as spreadsheets or search aides such as Google Desktop Search will be better suited for your research than CAQDAS. However, Microft Word, which has been suggested as a CAQDAS substitute (La Pelle 2004), in the fewest cases will be the most suitable substitute. Most contemporary CAQDAS with the exception of HyperRESEARCH, which is indigenous to the Apple Mac-OS, but also features a Windows version, and TAMS, which can only be used with Mac-OS and Linux, are built for Microsoft's Windows platform. Below table overviews the basic technical features of the programs. The ergonomics of a program might not be the most essential criterion for the choice of a program, but in some cases it may very well be one criterion. Your learning curve of a program depends at least partially on the question of the intelligibility of its user interface. That kind of userfriendliness depends on the clarity of its menu structure, your familiarity with its overall structure and the intelligibility of its graphics. The former will depend on your familiarity with its graphical outlook, i.e. for most contemporary users the interface should resemble modern Windows programs, while the latter will depend on the choice of icons and their textual description. The biggest advantage of computer-assisted content analysis is its capability to handle bulk data. If you want to handle large amounts of data with some interpretive input by the analyst, then a fast handling of the interface is essential. Therefore, customizable keystroke commands would be desirable for efficient data handling. Finally, the easier intelligible a program is, the more likely it is that you will know all of its options, as most people do not tend to read through the manual. Unfortunately, almost all contemporary CAQDAS do not behave like modern Windows programs, but their window design and handling is frequently oriented at outdated versions of Windows. Except for N6, which features an archaic Windows 2 style interface, which pastes command lines into a window, all programs are highly mouse oriented, excluding less intuitive, but faster keystroke commands. For Windows users, it might be at first confusing that HyperRESEARCH even in its Windows version behaves like an apple program, even emulating characteristic Apple sounds. HyperRESEARCH windows are also the most difficult to handle in Windows, because they again behave like Apple windows and open four main Windows windows instead of a variety of subwindows, as most indigenous Windows programs do. ATLAS.ti, whose search window (shown below) contains buttons labeled with a single letter and whose default layout clutters its interface with a button, whose sole function is the production of a computer voice proclaiming "I hate computers" does certainly not deliver a groundbreaking interface with respect to ease of use. Thankfully, from Built 62 onwards, this button can be removed by checking the option "be serious" in the preferences menu. The main menu of NVivo does not offer the familiar structure of drop down menus on, but instead offers a "Project Pad" (pictured below), which contains several buttons on several nested tabs. MAXqda, QDA Miner and Qualrus follow the normal layout of Windows programs most closely. The latter two programs also offer the easiest window handling. Even though some CAQDAS by now also organize effectively multimedia data, the core data for all content analyses remain to be textual data, which are much easier to search than visual or audial data. Traditionally, CAQDAS have been used for transcribed interview data, where the analyst could choose the file format. Media studies, in particularly studies of the new media, however, frequently analyze already existing text files, whose format therefore cannot be influenced by the researcher. It would thus be desirable, if CAQDAS could handle a wide variety of data formats. The most important format is, of course, still plain text. But plain text is not always plain text. Most programs will handle the standard English ascii character set, but some have problems with different iso definitions for other languages, which contain accents (e.g. ê), Umlaute (e.g., ö), or funny currencies (e.g., €), not to speak of Cyrillic or Γρεεκ characters (let's no go to pictorial languages). Most programs can handle these different encodings only with great difficulties, hence in practice, it is frequently advisable to convert all textual data into formatted text, particularly, if you use documents in different languages at the same time. Except for N6 and HyperRESEARCH (which allows for some limited manipulation of the code page for characters), all CAQDAS now allow for text in rich text format. Even though html and xml are far more flexible and human readable formats, CAQDAS developers have adopted rtf as the primary format for formatted text, that is, if the software accepts formatted text. That means that for most documents you will need to convert your files into rich text format, which usually means that there will be conversion imperfections, particularly when it comes to tables, headers and other special sections of text documents. If objects like pictures or spreadsheets are embedded with a text file, only ATLAS.ti and QDA Miner will be able to display these. The latter two programs are the most versatile with respect to text files, with Qualrus being the only other program, which handles html. Most others can only process the textual components of rich text. But even the most versatile programs are still a long way from the freeware program Inforapid, which cannot code, but which searches (and in combination with its suite sister Cardfile can sort these files. The digital revolution has made it possible to store and manipulate video and audio data to supplant textual with visual analysis and to easily capture communicative strategies not, or only with meticulous transcription, picked up by pure textual analysis. Alas, most CAQDAS still do not support an effective integration of such data types. If you exclusively work with video or audio data, you might want to consider the freeware Transana, which performs all desirable coding and transcription functions. Simple searches retrieve text strings and/or codes from data. Frequently, the search results can be displayed in their context. Boolean searches offer various combinations of searches using the Boolean operators AND, OR/XOR, and NOT across various section of codes or texts. Placeholder searches allow you to use placeholders for certain characters, e.g. numerals, paragraph marks, etc., in text searches. Proximity searches are similar to Boolean searches. These searches allow you to retrieve combinations of two or more text strings and/or codes, which occur in a definable proximity to each other. Fuzzy searches or "approximation searches" are exclusive to NVivo, allow you to perform fuzzy searches that retrieve textual data. Such type of search is particularly useful, if you expect your data to contain typographic errors. Combination searches allow you to combine any of the above searches with Boolean operators. NVivo's search functions, which owe much to earlier NUD*IST releases, no longer beat the competition "hands down" (Weitzman and Miles 1995: 248), but NVivo still is the only program that allows for fuzzy searches. ATLAS.ti offers sophisticated GREP searches, which have supported UNIX users since the early 1970s. None of the search tools for text, however, are as versatile as the ones the freeware InfoRapid Search&Replace, which processes a wide variety of text formats from plain text to Adobe Acrobat files, offers. 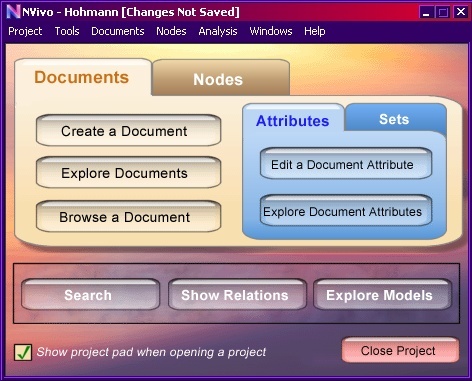 Especially in conjunction with the fuzzy searches of SimFuz,1 another freeware, this little helper application, which also features an add-on data file management system (InfoRapid Cardfile), offers a viable alternative for methodologies — such as some brands of Discourse Analysis — that do not require any coding of data. Below table overviews the search capabilities of all programs. Coding is at the heart of CAQDAS, and a wide variety of coding techniques exist. Free coding allows you to assign any code to arbitrary sequences of data. After searching your data for certain text and/or codes, you might jump to your finds and code them in context. Most programs allow you to perform text and/or code searches and assign a code to the search results. Qualrus has no such in-built facility for the automatic coding of text searches, but its script language allows you to perform complex autocoding procedures. Qualrus uses some techniques borrowed from artificial intelligence to suggest codes. ATLAS.ti allows you to store search patterns in so-called "supercodes." This way, any new or changed data added to a project will be automatically coded through these codes. Most CAQDAS allow to define variables, in which document-wide attributes (such as the gender of a person interviewed, or the edit oral desk for a newspaper article) can be stored. HyperRESEARCH, Qualrus and Atlas.TI also allow you to apply codes to sequences of certain video and audio files. Most CAQDAS allow you to annotate your codes in a variety of ways. Memos are not really codes but little bits of comments that can be attached to data or codes in a way that resembles Post-It™ notes on hardcopies. All codes are usually stored in a codebook, which in some programs can be structured in a hierarchy and/or a network. Some programs also allow you to color codes to organize them. Some CAQDAS, namely ATLAS.ti, HyperRESEARCH, NVivo, and Qualrus, allow for the visualization of theoretical models among variables/codes in diagrams. While these model builders are not as flexible graphic programs such as Corel Draw, they are much easier to operate. While HyperRESEARCH merely allows you to diagrammatically link different codes with each other, NVivo and Qualrus offer several types of links to depict causality, interdependence, hierarchy, and contradiction. ATLAS.ti offers the by far most flexible model editor, which allows you to customize the types of linkages between codes. It is also the only editor that actually links the codes among each other via hyperlinks. One of the greatest advantages of CAQDAS are their efficiency. Instead of cumbersome searches through filing cabinets or myriads of loose cards, you can search for your data or notes at the ease of a mouse click. However, CAQDAS are not always the fastest or even the most stable programs. Here we document our experiences with the stabilty and speed of the different programs. We measured the stability and speed of the programs using a 2GHz Pentium 4 computer with 512MB RAM running the Windows 2000 operating system with several, typical Office programs running in the background: A mail program (Qualcomm Eudora), an inter browser (Mozilla Firefox), a Word processor (Microsoft Word), a statistical package (SPSS), and Adobe Acrobat. Each CAQDAS was supplied with 2,626 plain text (in the case of MAXqda, which does not allow for plain text: rich text) documents, which ranged from 30 Bytes to 10 Kilobytes in size. All features of the programs were then tried out over a period of several days and the number of crashes were noted down. Since the differnt programs have different ranges of functions, the crash figures are not fully comparable: A program might have a bug in a function some of the other programs might not even offer. Likewise, different versions of Windows might yield very different results. Yet, we feel that a program should be bug free to ensure a smooth working process. Using the standard Windows Task Manager, the CPU time was measured. Finally, we ran simple, Boolean and proximity text searches and measured the time it took to perform these searches. Except for MAXqda, all CAQDAS frooze at least once, i.e. did not respond to user input after a waiting period of 3 hours. It therefore seems advisable to always create backup copies of the project one is working with. Kwalitan was the least stable program. Most of its bugs did not crash the program entirely, but often just displayed error messages — some of them in Dutch — which require a subsequent restart of the program. While there is little loss of information, this can become quite a nuisance. NVivo, which to be sure is not intended for the amount of data we used in the test, tended to use up so much CPU time, that it quasi frooze, when some functions (such as the display of coding stripes during coding or editing) were performed. Much of the search and coding functions moreover became unusable, once a project surpassed a few hundred files. Below that limit, the program worked fine. ATLAS.ti was considerably more stable, but it too ran into time problems, when searches and codings were performed over several hundred files. Qualrus improved yet again over ATLAS.ti, both in terms of stability and in terms of speed for those functions it offered an equivalent to ATLAS.ti. Finally, QDA Miner and MAXqda both were the most stable and the fastest CAQDAS. MAXqda 2 stable (0) low 0'10" 0'19" 0'17"
Even though CAQDAS are expressly designed for qualitative analyses, one of the most promising fields for methodological enhancement through CAQDAS lies in mixed-method approaches, as most CAQDAS should handle bulk data very efficiently. Word counts, in particularly when combined with lemmatizations (word stemming), might reveal useful hints for potential keyword codes. Crosstabulations and word maps might identify themes in the data. Most importantly, the export of data, such as code frequencies across documents, enables statistical analyses withe the appropriate external software. In contrast, the possibility to directly perform more complex quantitative content analyses within CAQDAS, while convenient, can take a backseat, if the latter data exchange facilities are offered. At any rate, currently only QDA Miner, which is integrated in the Simstat Suite for statistical analyses offers such functionality. As displayed in below table, which summarizes the statistical facilities offered by the different CAQDAS, all of the programs offer unproblematic transfer of their data to statistical packages and spreadsheets, once the data have been generated. The major differences therefore lie in the ease of data generation. Most programs (with the exception of NVivo and Qualrus) allow for the display of simple word frequencies. ATLAS.ti and MAXqda with its plug-in MAXdictio allow moreover for the usage of manually defined stop word lists, an essential tool for all quantitative analyses. QDA Miner goes even a step further, as it contains inbuilt and links to dictionaries. QDA Miner is also the most sophisticated program, when it comes to the analyses of co-occurrences of codes and/or strings, as it not only allows for the visualization of co-occurrence matrixes, but also for a number of clustering methodologies. All newer CAQDAS allow for some visualization of co-hierarchy matrices; NVivo, for instance, colors co-occurrences darker, the more frequent they are. Finally, a major consideration in the use of CAQDAS for mixed methods is their speed, which will be discussed in the next section. Even though most CAQDAS perform similar tasks, still every CAQDAS features some idiosyncrasies. The most common peculiarity is probably the technical terminology each CAQDAS uses. For instance, the database, which holds (or links to) all files that belong to a particular project is called "project" in most programs, but the developers of ATLAS.ti insist on the label "hermeneutic unit," while HyperRESEARCH uses the term "study." Similarly, NVivo and N6 speak metaphorically of "nodes," where the mainstream of CAQDAS developers have opted for "codes." QDA Miner, part of the Simstat Suite, allows for sophisticated quantitative analyses of textual data, which includes the visualizations of word maps. Alternative programs, such as Leximancer or AutoMap, might fulfill similar functions for other CAQDAS. Qualrus is the only program, which uses Artificial Intelligence technique to assist users with coding suggestions.1 It also is the program allows through a scripting language to automate recurring tasks, such as the automatic coding of open ended questions in surveys. N6 requires you to predefine the textual units you want to code. It offers a scripting language, which lets you automate tasks. The other pages in this section have hopefully given you an overview about the functionality of CAQDAS, which can assist you in the choice of CAQDAS, if you know what kind of tools are required for your methodology. There are a few areas, which I have not covered, but which nevertheless may be crucial for your decision, which software to use for your work. Most importantly, I have not (yet) covered the softwares' capabilities for teamwork and the merging of projects. Also, I have left aside issues of data archiving. In a recent review of the potentiality of QSR software for mixed methods, Bazeley (2002: 241) praises "the advantages NVivo offers to the mixed methods researcher, [which] are, in the first instance, enhanced flexibility and convenience." Our evaluation paints a different story: Because of its limitations for larger projects, NVivo is decidely unsuitable for mixed-method approaches that use larger amounts of data. From the QSR range, we would therefore recommend N6, if any, for mixed method studies. Unlike NVivo, N6 has no problems with larger datasets and unlike most other CAQDAS, N6 offers a scripting language, which lets you automate processes. Unfortunately, though, N6's capabilities with respect to the size of a project are bought with a decrease of flexibility, as N6 is the only current CAQDAS, which requires preformatted plain text files as input. ATLAS.ti, on the other hand offers both flexibility and capacity for larger projects, but its speed does not allow for efficient mixed-method strategies, once a certain number of data files has been exceeded. As in NVivo, it is less the sheer amount of data which matters in this respect, but the number of files influences the speed much stronger: While there is no problem to handle 5 files of 1,000KByte each, 5,000 files of 1KByte each bring NVivo to a standstill, while a simple autocoding with ATLAS.ti will give you time to have a short coffeebreak. During that time Kwalitan might have produced 20 error messages, as its instability is a serious issue under Windows 2000. Finally, Qualrus contains no in-built autocoding functions and therefore is only be suitable for semi-standardized material, such as open-ended interviews. On these, it performs well, not the least because it is the only CAQDAS that offers a scripting language. Most mixed methods studies will thus fare best with either MAXqda or QDA Miner, as these run fairly swiftly and stable across larger data sets. Unfortunately, neither offers currently multimedia support. If you also want to analyze videos and pictures, you therefore will have to recur to ATLAS.ti or HyperRESEARCH, whose speed we unfortunately did not test yet. Like many other methodological approaches to the analysis of discourse2, Discourse Analysis is a proliferated paradigm. Nevertheless, there are some recurrent themes in Discourse Analysis, which emphasize the discursive context (e.g. Antaki et al. 2002: 6) and the importance to examine discursive resources that are not utilized (Hammersley 2002: 768). In its narrow sense, coding, which seperates quotations from their contexts, and which cannot investigate silences, is therefore usually antithetical to Discourse Analysis. Although it is certainly possible to use coding primarily as a way of organzing data (Gibbs 2002: 4), the severe restrictions on the types of data most CAQDAS allow for and the decontextualizing effects of coding outweigh in my view the advantages such organization strategies have. Instead, most Discourse Analysts will primarily need to search their data. Of the classical CAQDAS, NVivo offers the largest variety of search functions. Except for fuzzy searches, which are important for data which contain many typographical errors, ATLAS.ti's search facilities are also quite sophisticated, and unlike NVivo is able to effectively handle (read: code) audio and video data. Yet, search functions are equally well performed by InfoRapid Cardfile, which also is the most liberal in the acceptance of file formats. Since with respect to coding, NVivo's only advantage is a fuzzy search facility, can be emulated by the freeware SimFuz, Cardfile seems the obvious choice for most Discourse Analyses that do not require coding features. Since in ethnography the analyst is confronted with a host of different materials, it is imperative that a wide variety of data can be handled. Currently, only ATLAS.ti, HyperRESEARCH, and Qualrus allow for the effective integration of multimedia data. I would very much encourage you to contact me, if you would like to suggest further affinities. For frame analysis, cf. Entman 1993. Content Analysis is somewhat more coherent, but Weber (1990: 13) still rightfully insists that "there is no single right way to do content anlysis" (boldface: mine). For a few menu items and error messages. the English translation is missing. By "Window Handling," the navigation between the different functional windows, such as code book, case or text brwoser is meant. While coding, the Video Window is in the background. It therefore cannot be maximized during coding. The (now defunct) freeware SimFuz (Download 131K) performs sophisticated fuzzy searches on text, HTML, and older Word™ files. Searches in Kwalitan are implemented through filters. There are two reasons, why in vivo coding may be hazardous. From a theoretical point of view, it is imperative to "break" (Bourdieu, Passeron & Chamboredon 1991) with the communicative categories of everyday speech to analyze discourse effectively. From a practical standpoint, the ease with which in vivo codes are applied might lead to a coding/data fetish, which prompts the analyst to "Code everything." (Cisneros 2003: 306) Obviously, these hazards can be circumvented, if one stays aware of them. Additionally, Kwalitan frequently produced error messages, which did not correspond to actual errors. When displaying coding stripes, NVivo frequently freezes. As seaches could not be completed, autocoding time could not be measure. QDA Miner does not show, when coding is finished. Autocoding in Qualrus requires prior definition of segments. ATLAS.ti's Word Cruncher took more than three hours to perform its task onto approximately 2,000 documents with maximum 10KByte size. Comma or tab delimited files are plain text files, which can be read by virtually all statistical and office applications. Note, that this is an inductionist approach, which is heavily contested among social scientists. Antaki, Charles, Michael Billig, Derek Edwards, and Jonathan Potter (2002) "Discourse Analysis Means Doing Analysis: A Critique Of Six Analytic Shortcomings", currently under review at Discourse Analysis Online. Bazeley, Pat. 2002. From N3 to NVivo. International Journal of Social Research Methodology 5 (3): 229-243. Entman, Robert M. 1993. "Framing: Toward Clarification of a Fractured Paradigm." Journal of Communication 43 (4): 51-8. Gibbs, Graham R. 2002. Qualitative Data Analysis: Explorations with NVivo. Philadelphia, PA: Open University Press. Hammersley, Martin. 2002. Conversation analysis and discourse analysis: methods or paradigms? Discourse & Society 14 (6): 751-781. Bourdieu, Pierre, Jean-Claude Chamboredon, and Jean-Claude Passeron. 1991. The Craft of Sociology: Epistemological Preliminaries New York, NY: Walter de Guyter. Cisneros Puebla, César A. 2003. Analisis cualitativo asistido por computadora. Sociologias 9: 288-313. David, Paul A. 1985. Clio and the Economics of QWERTY. American Economic Review 75 (2): 332-37. Dohan, Daniel and Martín Sánchez (1998): "Using Computers to Analyze Ethnographic Field Data," Annual Review of Sociology 24: 477-498. Heimgartner, Arno. forthcoming. Das System in der Komplexität: Atlas/ti, MaxQda, N6 und NVivo im Vergleich. In: Praxisbuch: Empirische Sozialforschung in den Erziehungs- und Bildungswissenschaften., edited by Hannelore Reicher and Hubert Stigler. Studienverlag: Innsbruck/Wien/München/Bozen. La Pelle, Nancy. 2004. Simplyying Qualitative Data Analysis using General Puropse Software Tools. Field Methods 16 (1): 85-108. Choosing%20a%20CAQDAS%20package%20-%20Lewins&Silver.pdf, last accessed: December 1, 2004. Lewis, R. Barry. 2004. NVivo 2.0 and ATLAS.ti 5.0: A Comparative Review of Two Popular Qualitative Data-Analysis Programs. Field Methods 16 (4): 439-464. Weber, Robert P. 1990. Basic Content Analysis. Thousand Oaks, CA: Sage. Weitzman, Eben A. and , Matthew B. Miles. 1995. Computer Programs for Qualitative Data Analysis. Thousand Oaks, CA: Sage.